Idlis and Dosais (Dosas) are a staple in all South Indian families. If you have the batter ready, you can prepare a variety of healthy and tasty meals in no time. I personally feel that to get perfect idlis the idli recipe has to be perfect and more importantly the urad dal has to be ground as smooth as possible. Getting the idli batter right is the key. Traditionally idli batter has to be fermented, but preparing idlis instantly is possible too. There are two methods of preparing the idli batter. One, soaking rice and urad dal separately; grinding it separately and mixing both the batters together and let it ferment overnight. 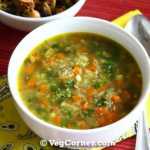 The other easy method is to mix store bought rice rava with urad dal batter and ferment it. 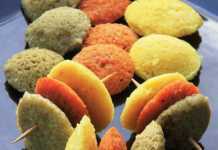 Instant idlis are mostly prepared with rava mixed together with sour yogurt and baking soda. For this cornmeal idli recipe, I have followed the latter. I bought medium ground whole cornmeal for the Whole Grain Baking Event – Corn and found that it was too gritty in baked goods. A fine ground variety should have been best for baking. I had a hard time powdering it again and again in my food processor and was wondering what to do with it when suddenly I got the idea for this idli. Since whole cornmeal looked similar to that of the idli rava, I was sort of confident that this would work. And it did work! Soak the cornmeal in 1 cup of warm water at least 5 hours before you intend to prepare the idli batter. Wash and soak the urad dal too separately, at the same time or 2 hours before you intend to grind it. I use a wet grinder for grinding idli and dosa batter. Switch on the grinder and add about 1/2 a cup of water. Now to this add the urad dal little by little and water as required. 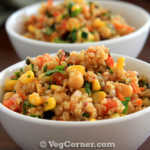 The urad dal batter has to be nice and fluffy, so be careful while adding water. It will take about 15-20 minutes to get the right consistency. Now to this batter add the soaked cornmeal and let the grinder run for a couple of minutes until the cornmeal is incorporated well with the urad dal batter. Transfer the cornmeal idli batter to a container which would hold twice the volume of the batter to allow enough room for fermentation. Mix in the required amount of salt and oil and combine well. Keep it in a warm place and let it ferment for at least 15-17 hours. Once the idli batter ferments, grease the idli molds with oil or ghee and fill it with the batter. I usually grease the bottom of each mold too, so that the batter from the layer below does not stick to the plate on the top. Steam it in a closed vessel or a cooker for 10-15 minutes, if using an electric range. I gave some extra time considering the texture of the cornmeal. Test if the idlis are ready by inserting a toothpick in the center and it should come out clean. If its ready splash some water and run a knife around the idli to unmold it. Serve it hot with your favorite side dish. Since I have used medium grind cornmeal in this idli recipe, I’m not sure how the fine grind variety will work. I think it’s advisable to use the cornmeal which has the texture of idli rava. So I think that corn grits should also be fine in this recipe. 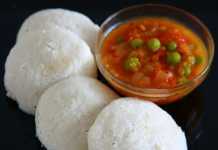 I felt that these idlis were sweeter than the usual rice idlis, so the side dish has to be very spicy. I had some leftover idli batter; so prepared dosas the next day. It was very good. 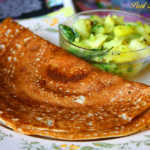 The cornmeal dosas were light and crispy. red rice: 1/2 cup; white jasmine rice /1/2 cup., par boiled rice: /1/4 cup (Uncle ben’s ), urad dhal : ; channa dhal : 1/4 cup; tuvar dhal: 1/4 cup., 1 cup; rice flour : 3/4 cup., fenugreek: 2 table spoons ( I dry grind fenugreek seeds and keep them in a bottle- Can use them for seasoning other dishes as well). Soak the dhal in a separate bowl. Soak the other 4 ingredients: jasmine rice, red rice, chnna dhal and tuvar dhals all in one bowl. Blend the urad first. Blend the second bowl with rice and the other dhals together as fine as possible. Add water little by little. Mix everything in a larger bowl, add fenugreek powder and 1 tea spoon turmeric ( yes, turmeric–it is very good for your body). Let it ferment overnight . It makes good dosas ( not at all sticky) even on the same day. But fermenting overnight makes better dosas. You can make a large batch and after fermenting freeze one or two containers . You take out the frozen one the night before or in morning and let it sit on the kitchen counter. It will be ready to be made into dosas for dinner. This is fail proof and very tasty. After you taste this you won’t like restaurant dosas. Just FYI. I am not a vitamix dealer. I simply wanted to share something that works so beautifully for our Indian cooking. I don’t like to use vitamix to blend chutney. it blends the coconut too fine… so much that within seconds you can see coconut oil separating. 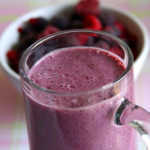 But it’s a great blender for fruit/ vegetable juices, soups ( can make hot soups in the blender itself). Will let you know after I try making idli batter. Still trying to find the best idli ( the ones that are soft and porous) recipe. Gita, thank you very much for taking your time to share your experience with Vitamix. I’m also thinking of getting one. 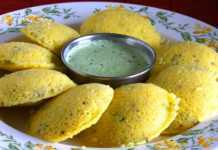 Such a beautiful cornmeal idli..looks soft and yumm..